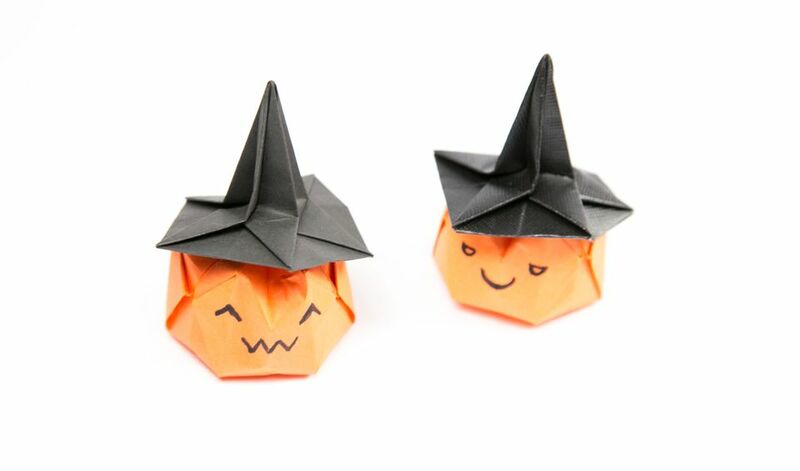 Make an origami witch hat just in time for Halloween! You can make these little origami witch hats to adorn your kids, pets or teddies at Halloween. This adorable holiday craft is perfect for decorating (make a bunch and string them up!) or just a great activity to get you in a spooky mood. Make a few while watching Hocus Pocus or your favorite horror movie. 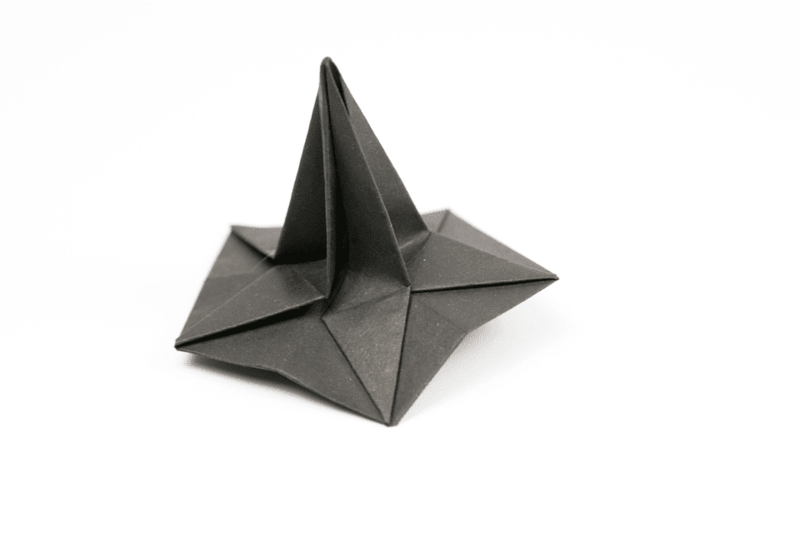 When you look at this origami hat from the top, it's as if it's a pentagram–a five sided star. On the underside is also a star. Fittingly, the pentagram is a symbol used by many modern day witches, 'wiccans,' and among other religions. Fold your sheet of paper into a triangle, by folding one corner to the opposite corner. Bring the right corner over to meet the left corner and make a small crease in the middle. Next, bring the left corner up to meet the top point, again make a little crease in the middle. Fold the left section diagonally up from the crease on the bottom edge and align it with the crease you made in the last step. Bring the right edge over to the left edge. Next, fold the leftside top layer back over to the right, aligning it with the right edge. Fold the top right point down and crease well, aligning it with the right edge. Fold it back up again. Use some scissors to cut along the crease you just made. Position your paper so that the color of your hat is facing up (This step applies if your paper has different colors on each side). Make the creases that are indicated by the white dotted lines, valley folds and the creases indicated by red dotted lines, mountain folds. Collapse the paper by pushing all of the points to the center. Fold the top point down to the bottom point, only creasing the middle section. Fold the right edge of one layer to the left, aligning with the central crease. Unfold the last step and fold the right point of that flap diagonally inwards. Repeat this step on all of the other sections. Flip each section to the left once complete and bring more sections around from the back. To make it easier, you can also draw this line in pencil for the next step. Open out the bottom end of the paper a little using your thumb. Make a crease along that line you just made. The line starts at the bottom left point and goes diagonally up to meet the central crease and the vertical crease. Repeat this step on all the other sides. Open out the bottom of the paper while holding onto the top sections. Turn the model upside down to see the underside take shape. Place the hat flat on the table. It may not sit straight–this is normal. Optional: Pick up the hat and crease the top sections as shown. If you'd like to, you can fold the edges of the hat inwards on the underside. You can shape the hat in different ways, either quite straight and symmetrical or lopsided and ragged! Make a bunch of these hats and decorate your home at Halloween by placing these origami hats on top of little pumpkins or by stringing them up as a garland. You may have even noticed that the origami witch's hat also looks like a pretty flower if you turn it upside down, so these are perfect to make again for spring and summer decor!